Playing in certain rooms the reflections from the ceiling may give some issue. Indeed, especially with green lasers, the reflected light is so strong that you can easily read and write documents with. 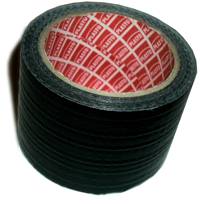 To prevent any strange behavior of the laser harp with strong reflecting surfaces as low and white ceilings (these last ones: frequently used in US and North Europe), we suggest to apply this special tape to the ceiling and all the issues will be solved.